Free trolley rides are provided to downtown sites from the World's Fair Park and the UT Campus by Knoxville Trolley Lines, the city of Knoxville's free shuttle service. Knoxville Museum of Art (KMA). 1050 World's Fair Park. Phone: 865-525-6101. Open Sun 1-5 pm; Sat, Tue-Sat 10 am-5 pm. Free admission, free parking. Higher Ground: A Century of Visual Art in East Tennessee (permanent). Alive After Five. Live music on select Fridays (6–8:30 pm) in the Museum's Great Hall. Cash bars, dancing, catering. $15 for non-members; $10 for members and students. Frank H. McClung Museum. 1327 Circle Park Drive, University of Tennessee. Phone: 865-974-2144. Free admission, open Mon-Sat 9 am to 5 pm, Sun 1-5 pm. Exhibits: Ancient Egypt: The Eternal Voice; Archaeology and Native Peoples of Tennessee; Decorative Experience; Discovering American Indian Art; Geology and Fossil History of Tennessee; Human Origins: Searching for our Fossil Ancestors; The Battle of Fort Sanders; Tennessee Freshwater Mussels, more. Ewing Gallery of Art and Architecture. University of Tennessee, 1715 Volunteer Blvd. Phone: 865-974-3200. Open Mon-Wed, Fri 10 am-5 pm, Tr 10 am-7:30 pm, Sun 1-4 pm. Laurel Theater. 1538 Laurel Ave. Phone: 865-522-5851. The Laurel Theater is a 220-seat performance center and home of Jubilee Community Arts, an organization dedicated to the preservation and advancement of traditional music and art forms of the Southern Appalachians. Concert calendar at http://www.jubileearts.org/calendar.pdf. English Country Dancing. Sundays at 8 p.m. 17th-18th Century Social Dancing with live music. This is a performance group and newcomers are welcome. Knoxville Country Dancers. Contra dancing to live acoustic music. Monday nights at 8. Knoxville Square Dance. Appalachian square dancing with live old-time music. Second Thursdays at 8 pm. Knoxville Writers' Guild. 7 p.m. first Thursdays. The Writers' Guild provides a forum for information, support, and sharing among writers. Old Harp Singing. Everyone is welcome and encouraged to participate in this unique tradition of community and harmony. second Sundays at 7 p.m.
Trollkretsen Scandinavian Dancers. Tuesdays at 7:30 p.m. Dances include polskor, schottische, waltzes and more. World's Fair Park. Home of the 1982 World's Fair, the Park is located near the UT campus and downtown Knoxville and contains the Sunsphere, the Court of Flags, the Tennessee Amphitheater and the Knoxville Convention Center. 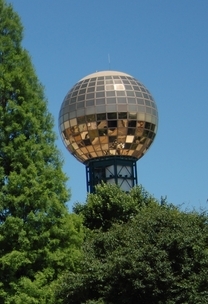 The Sunsphere, a golden glass ball atop a 266 ft tower, is now open to the public with no admission charge (9 am - 10 pm). Double elevators operate from the Convention Center level to the Observation Deck, which commands a 360 degree view of Knoxville and displays video clips and other information exhibits. James Agee Park, located at Laurel Ave. and James Agee St. in the heart of the Fort Sanders neighborhood memorialized by James Agee in his Pulitzer Prize winning novel, A Death in the Family. Clarence Brown Theatre. 206 McClung Tower. Phone: 865-974-5161. Dedicated to UT alumnus and film director Clarence Brown, this 576-seat theatre presents a wide variety of theatrical and dance performances by faculty, students, and professional guest artists. Bijou Theatre. 803 South Gay Street. Phone: 865-522-0832. The Bijou Theatre provides an excellent performance venue for local jazz ensembles, smaller choral groups, solo and small instrumental groups, student opera productions, and local musical theater. Regal Riviera, Stadium 8. 510 South Gay Street. Phone: 865-522-5160. Digital sound, stadium seating, rocking high-back seats. Tennessee Theatre. 604 South Gay Street. Phone: 865-684-1200. The Official State Theatre of Tennessee, hosting classical music, vintage films, dance, theater, and performances by today's hottest musicians. WDVX Blue Plate Special. An ongoing series of live concerts broadcast weekdays at noon on WDVX. Location: 4 Market Square at The Square Room (Fri) and the corner of Gay St. and Summit Hill Dr. in Downtown Knoxville (Mon-Thu). Market Square is located in the center of downtown Knoxville and provides entertainment, dining, shopping, and special events, features two water play fountains and is adjacent to scenic Krutch Park. Charles Krutch Park. 504 Market Street. Krutch Park is a scenic 1-acre park with small water falls, a stream, and picnic tables located in the middle of downtown Knoxville, adjacent to Market Square. Call 865-215-4248 to schedule an event in Krutch Park or Market Square Mall. Old City Historic District. The Old City specializes in shops and boutiques offering unique gifts, crafts, antiques, art and clothing; coffee shops, restaurants and nightspots. Located at the intersection of Jackson Avenue and Central Street, on the north side of downtown Knoxville. The East Tennessee Historical Society has helped preserve East Tennessee's unique regional heritage for nearly 170 years. 601 South Gay St., 865-215-8824. Open Mon-Fri 8 am – 5 pm. Admission Free. Permanent exhibits: Voices of The Land: The People of East Tennessee; The East Tennessee Streetscape. Blount Mansion. Blount Mansion was built in 1792 as the home of Governor William Blount. Located in the center of downtown Knoxville's government district, 200 West Hill Ave. Free parking. Open: (March through December) Tue-Fri 9:30 am - 5 pm. Phone: 865-525-2375. James White's Fort. 205 East Hill Avenue in downtown Knoxville, across the street from the Women's Basketball Hall of Fame, within walking distance of Blount Mansion, Market Square, Krutch Park, Volunteer Landing, Alex Haley Park and the Old City. Riverboat Cruise. 300 Neyland Drive. Phone: 865-525-STAR. The Star of Knoxville is an authentic paddlewheeler with a capacity of 325 passengers, providing dinner and entertainment while cruising the beautiful Tennessee River. Three Rivers Rambler This vintage steam engine train takes guests on a 90-minute excursion to the Forks of the River and back. Station location: Volunteer Landing on Neyland Drive between Calhoun's and the Boathouse. Phone: 865-524-9411.